When people fund art galleries, they seek to unite artworks they value under a single roof. Ewart McLaughlin, who provided the funds for the building of the Robert McLaughlin Gallery, played a similar role. He established the Gallery building in 1967 with, as its base, forty-seven works that had been collected by Alexandra Luke, his wife, a member of Painters Eleven, who had died that year. As well as being a member, she had been one of the most ardent supporters of the Group and had supported all the arts life-long. Her collection reflected her interests. It is eclectic, with handsome examples of Painters Eleven, some of them dazzling like William Ronald`s mysterious Darkness No. 2 with its sense of light shining from depths or Ray Mead`s Bouquet. In the early 1970s, the question of the Gallery`s guidelines came up. The then director, Paul Bennett, set them. He wisely chose – no surprise – Painters Eleven. He discussed it with me in 1972 at the Art Gallery of Ontario, where I was the first Curator of Canadian Art. “It`s a great idea,” I said. At the time, Painters Eleven, the first abstract painting group in Ontario, was the only group founded in Oshawa. It was officially formed in 1953 in Oshawa, in the studio and summer home of Alexandra Luke at Thickson`s Point, the result of the Abstracts at Home show, held at the Simpson’s department store in Toronto that October. The members included, listing them alphabetically, Jack Bush, Oscar Cahén, Tom Hodgson, Hortense Gordon, Alexandra Luke, Jock Macdonald, Ray Mead, Kazuo Nakamura, William Ronald, Harold Town, and Walter Yarwood. They seemed at the time, to each other and later, to members of the art community such as myself, to be an exciting, even crucial element in Canadian art. I had an additional reason for liking them. I had the benefit of seeing their work, and work like it, at the Riverside Museum in New York. The American Abstract Artists invited Painters Eleven to exhibit with them at the museum in 1956. Charles said he`d only give it to me if I promised to maintain the guidelines as Painters Eleven. To learn about them, I interviewed the living members, and the widows of those that had died. I accumulated their work for the collection. Some fine things had been bought before my time by Kay Woods, formerly the curator. She bought Harold Town`s major painting The Bridge, but I added where I could and through shows and publications began to bring the work the attention it deserved. Showing Painters Eleven wasn`t always easy. A man came into the gallery, looked at the exhibit and said, “This guy sure changed his style a lot.” Even the Board of Trustees had their doubtful moments. “I wouldn`t give a dollar for that work,” said one Board member, waving at a Jack Bush. But, in time, there was more acceptance. By the second half of the 1970s, our guidelines were well known enough that works by the group even were given to the collection. 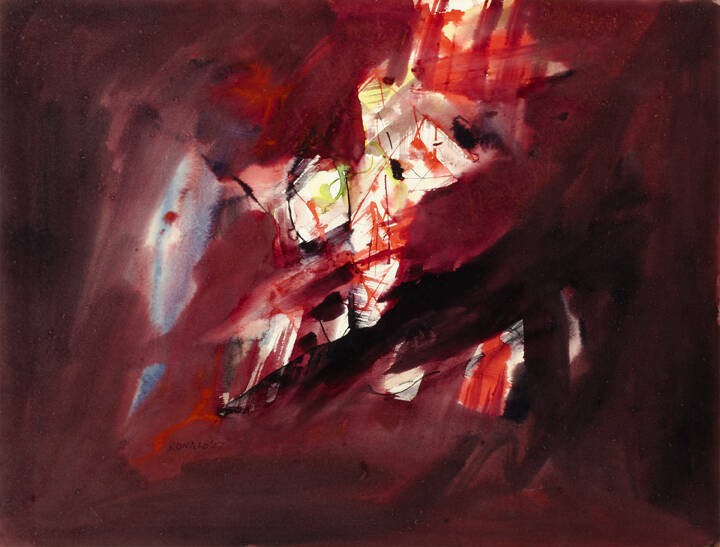 One such work was Hortense Gordon`s happy Colour Study (1960) which Walter Moos of Moos Gallery in Toronto gave in 1979 with the words, “It has no commercial value.” In other words, he couldn`t sell it so he was giving it to the gallery. Today, with the general admiration felt for the group, many would disagree. In the future, besides a rising price to the works, I expect new adherents to Painters Eleven. There will be a greater comprehension of their place in Canadian art history, more publications, and more works at auction. In other words, the fate we have seen of the Group of Seven, will be theirs also. Journey is a title the Group used often. Another was Adventure. In their paintings, they were always seeking, travelling, reaching out for the impossible. To be on the side of this new faith is an adventure for all that make it.